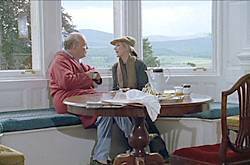 The filming location for the house of Lord Kilwillie (Julian Fellowes) in Monarch of the Glen is Balavil House near Kingussie. Both external and interior shots of the building have been used. Balavil House is a Robert Adam designed Georgian Mansion dating from the 1790's. 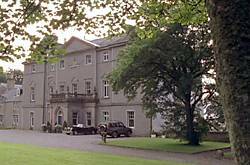 It is an upmarket Bed and Breakfast and is located a couple of miles to the east of Kingussie near the main A9 Perth to Inverness road.